Cervical radiculopathy is damage to nerve roots that is caused by inflammation and compression of cervical nerves located in the neck area. Patients suffering from this condition generally experience pain in the neck and upper extremities, along with motor problems, muscle weakness, a loss of sensation in different upper body regions, and numbness and tingling of the hands, fingers, or skin. Regions in which pain is typically felt in addition to the neck include the arms, chest, shoulders, and upper back. Initial forms of treatment typically involve a combination of physical therapy and pain-relieving medication, such as anti-inflammatory medicine (e.g., oral or injected steroids) or non-steroidal pain medicine (NSAIDs). If chronic pain is present due to significant compression of the nerves, more intensive procedures such as a steroid injections or nerve blocks may be recommended. One of the most common conditions that causes cervical radiculopathy is cervical disc herniation. However, there are additional causes such as spinal disc degeneration (e.g., spondylarthrosis), arthritis, nerve injuries, and ruptured discs, as well as tumors and spinal infections, which are the least common causes. Smoking has even been indicated as a potential risk factor for cervical radiculopathy. Diagnosis of this condition can be determined by several methods such as magnetic resonance imaging (MRI) and electromyography, which helps clinicians rule out other potential problems. Tests such as the shoulder abduction test (SAT), the Spurling test (ST), and the upper limb tension test (ULTT) are also being increasingly used to diagnose cervical radiculopathy. These tests are used to evaluate nerve root pain. Some of the most common causes of Cervical Radiculopathy are stress, fatigue or lack of sleep, hormones, food, medical problems, and trauma. Opioids are pain-relieving medications such as morphine, oxycodone, and codeine that are stronger than pain medications such as ibuprofen or acetaminophen. If the pain and inflammation that is caused by cervical radiculopathy becomes chronic or is unresponsive to high doses and even prescription strength doses of ibuprofen or acetaminophen, opioids may be prescribed instead. Opioid treatment is generally short-term as prolonged consumption may lead to dependence, drug abuse, or even overdose. Furthermore, the administration of opioids is closely monitored and different treatment options are recommended if pain continues to reemerge during opioid treatment. The cervical steroid injection and epidural steroid injection are similar techniques that involve using a needle to inject medication into the region where affected nerve roots are located. For a cervical injection, medication is administered between vertebrae in the neck region, while medication can be administered in different locations for epidural injections, such as through the middle of the back, the lower back, and the side of the spinal vertebrae. Both procedures entail injecting a steroid that reduces inflammation, and an anesthetic that leads to the reduction or elimination of pain. These are brief procedures and some patients have reported experiencing immediate pain relief. It can also be repeated if necessary in order to improve the treatment outcome. The risks associated with steroid injections are minimal and include nerve injuries from the injection, minor bleeding, infection, and headaches. Side effects from the medication that is injected may also occur. The placement of the needle is typically visualized through imaging techniques such as fluoroscopy which minimizes the risk of injuries. A nerve block is also similar to a steroid injection, in that it involves the insertion of a needle into regions where affected nerve roots are located in order to administer medication. However, in addition to injecting a steroid and anesthetic, an agent that disintegrates nerve tissue in the affected area may be administered to alleviate pain. This is a more long-term form of treatment. 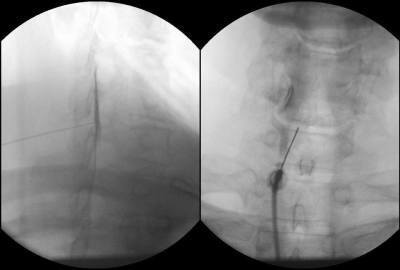 Risks involved with a nerve block include possible injury to arteries, veins, or nerve roots during needle insertion, but using imaging techniques such as fluoroscopy, ultrasound, or computed tomography (CT) during needle placement greatly reduces this risk. Cervical radiculopathy is nerve root damage that is the result of inflamed and compressed cervical nerves in the neck region. This condition can cause pain in the arms, chest, shoulders, and upper back as well as motor problems, muscle weakness, a loss of sensation, and numbness or tingling in these regions. Typical causes of cervical radiculopathy include cervical disc herniation, spinal disc degeneration (e.g., spondylarthrosis), arthritis, nerve injuries, ruptured discs, tumors, spinal infections, and even smoking. Initial treatment usually involves anti-inflammatory medicine or injections, non-steroidal pain medicine, and physical therapy. Chronic symptoms and pain that does not decrease in response to initial treatment may be subsequently treated through the short-term use of opioids and procedures such as a cervical or epidural steroid injection or a nerve block. Steroid injections and nerve blocks are brief procedures that quickly reduce pain, can be repeated if necessary, and generally produce long-term results.